life. He confesses to some sort of anarchism and to having been a loner, apart from the women he adored. Sounds almost like Assange – only joking. Funny how people see themselves. Interesting his take on transparency. He reckons that in the future there will be a time where we have no more secrets from one another. An early Facebook aficionado! A dreamer like Mark Zuckerberg? The world, in terms of a network of human actors, is a complex and an emergent system, that also includes technologies and communication systems and is getting more complex every day. Yet our emphasis is still on humans and how we interrelate with objects. Here I disagree with some aspects of object-oriented philosophy. Keep in mind, deception has been an important positive evolutionary development of early hominids, still to be seen in Chimpanzees, who separated from us only 5-7 Million years ago! Positive in the sense of an adaptive trait enhancing survival. These post-war intellectuals, no matter how high I hold them in my esteem, didn’t know much about biology, anthropology, evolutionary psychology, nor physiology itself. Freud was the star in the study of the soul in those days, but unfortunately not much of his wisdom holds up to scientific scrutiny. His theories were based on spurious evidence. See Why Freud Was Wrong – Sin, Science and Psychoanalysis by RICHARD WEBSTER. Neuroscience, as we know it, wasn’t around yet. For them, and for many intellectuals today, mind and spirit was made of different stuff than brains, peptide molecules and atoms. The Cartesian split, the ethereal mind versus the material body. They knew nothing about information theory or the phenomenological experience of selfhood. Their perception of total freedom, i.e. Sartre, seems to us like Kindergarten spiel or Disneyland, whatever angle you take. There is no such thing as total freedom. We are constrained by our social environment and our upbringing. Imagine walking around dressed up like Mozart. You would never do this unless you would be singing an aria on stage. Why not? You are free to do so. As you can see there are some serious constraints on what we allow ourselves to do and what not. But there are situation where we might have to jump over the fence. The current wikileaked world shows that certain political groups of interest use information deceptively if required to get their imperial agenda across. Others try to foil their attempts, so it’s spy versus spy! Or is it chimp versus chimp? Or us versus THEM? I wonder whose side is FOX BUSINESS rooting for these days? Watch this! Or are we still all deceived and there is yet another agenda behind all of this? Whatever it may be, there is grounds to believe that we do have SOME freedom to decide whose side we’re on. 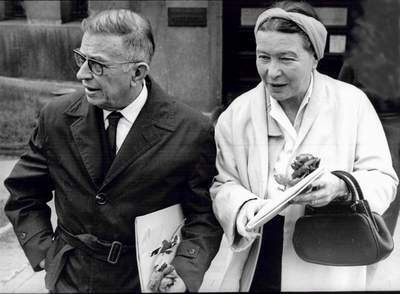 So Sartre, you’re still cool, maybe more than ever, we still need you. We are in such a new world it is hard to imagine what those post-war intellectuals would make of it today. Identity is shifting as the world changes and more and more the locus of that identity is represented online. Will individuals lean on this in times of crisis? When our worlds fall apart will we look within to define ourselves, or will we draw on our networks to reconnect and reconfigure ourselves? If the latter, how long before facebook can recommend a new identity for us? Next Next post: Android ?